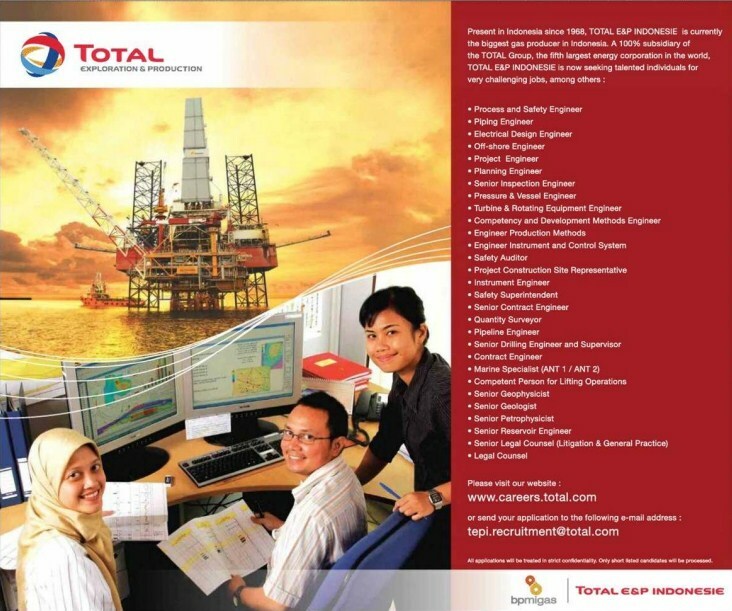 TOTAL E&P INDONESIE is a 100% Indonesian Subsidiary of the Paris based TOTAL Group, having its Head Office in Jakarta and operational sites in East Kalimantan. It was incorporated in Jakarta on 14 August 1968. Since then, it has been working partnership with the Indonesian Government, as a Production Sharing Contractor in the search for, and development of, Indonesia’s vast hydrocarbon reserves. TOTAL E&P INDONESIE oriented its efforts on the hydrocarbon potential of the Mahakam towards natural gas as the key to its nature in East Kalimantan. Exploration and appraisal works let to discoveries of considerable reserves of gas in the Peciko, Tambora, Tunu, Sisi, and Nubi fields making the company to become the largest gas producer in Indonesia, supplying 80% of feed gas to Bontang plant (the largest producing LNG plant in the world). All applications will be treated in strict confidentially, only short listed candidates ill be processed. Jobelist.com - Powered by wordpress - 20 queries. 0.787 seconds.